Hello, dear Persia Lou readers! My name is Amy and I blog about food (with occasional food videos), travel, and my weekly free printables at Club Narwhal. I’m so excited to participate in Persia Lou’s Handmade Holiday extravaganza. For me, the holiday season is not complete without an ugly sweater party. Combine that with a hilarious white elephant gift exchange and you are really speaking my language. 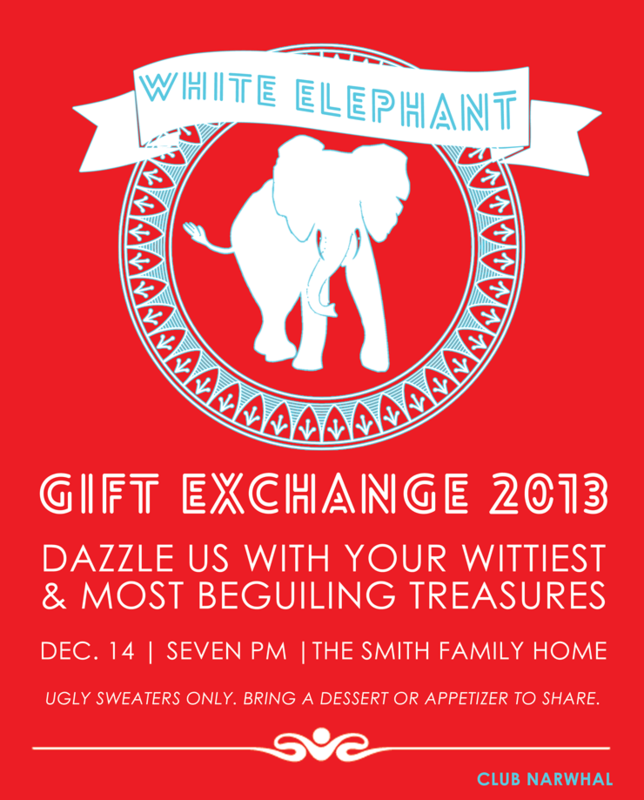 I wanted to share this modern White Elephant Gift Exchange invitation with you today. Feel free to download it for your next holiday party (the Club Narwhal watermark seen above will not show up on your digital download)! Keep reading for a quick tutorial that shows you how to customize the invitation’s details using Picmonkey, a free and totally awesome photo editing website. It’s so easy, you won’t believe it! Step 1. 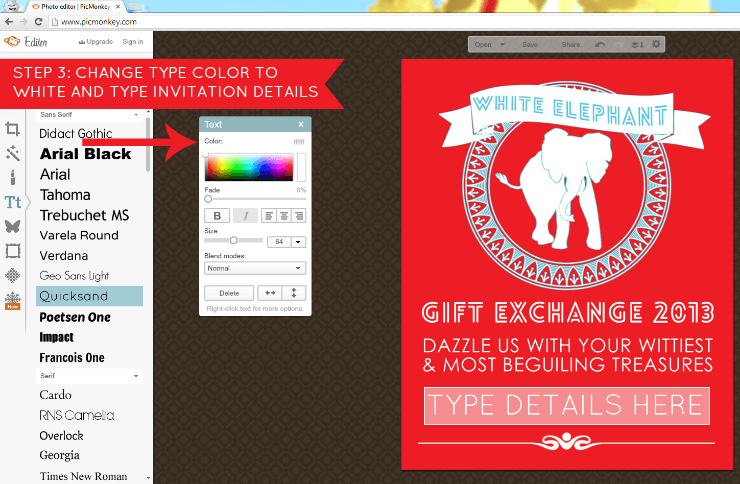 Download the blank invitation template by clicking on the glittery download button above. Save it to your desktop for easy access. Pull up Picmonkey in your browser. 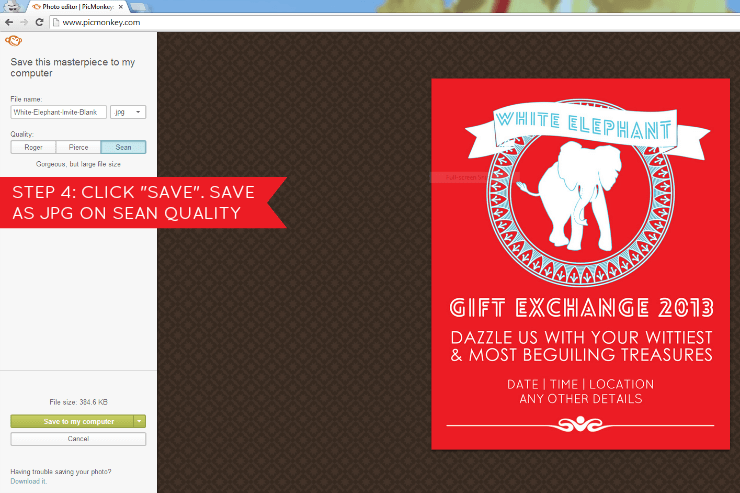 To upload the blank template, click “Edit a photo” and browse for the invitation. Step 2. To create a text box, click the “Tt” button in the left hand menu. Select your preferred typeface (I used Quicksand but Geo Sans Light would work, too). Then click “Add text.” Two things will pop up: a text toolbox and a blank text box. The toolbox is where you can change the size and color of the typeface. Step 3. 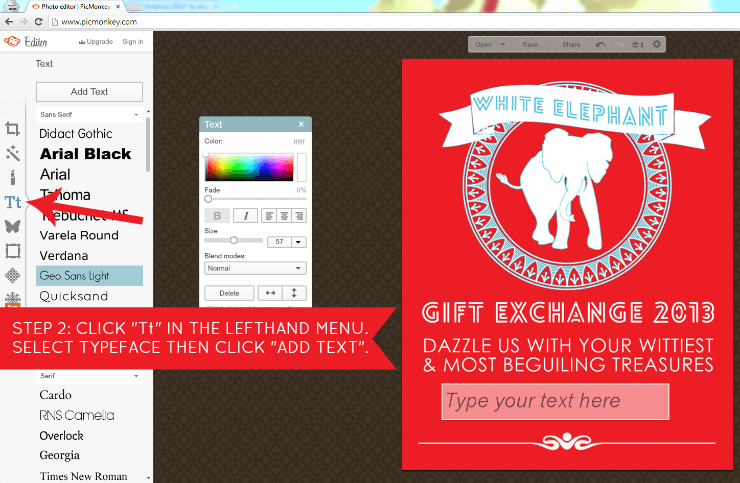 Change the type color to white by clicking the upper left hand corner of the color box. You can also type “ffffff” in the upper right hand corner. Click inside the blank text box (the box that says “Type Details Here” in the above image) to add details such as date, time, and location. On my invitation, I added a few instructions about what to wear and bring. *Tip: You can easily move the text box around by clicking on it. You can change the size by pulling on the arrows that appear when you mouse over the corners of the text box. Step 4. Once you’re satisfied with everything, click “Save” (the button will be directly above the invitation). If you are printing invitations out, save as a .jpg. If you are emailing or posting the invite online, save as .png (it will be easier to read online). And that’s it, you’re done! *Printing tip: To save time and money, I usually print invitations like this as 5×7’s at Costco’s photo counter (your local Walgreens or Walmart will also work). I use a matte finish so they seem a little less photo-y. If you dig this printable, head on over to Club Narwhal where I post new printables most Fridays. Or follow along on Pinterest (click on the Free Printables Board). I would love to hear from you so give me a shout out on Twitter or Facebook! Are you guys planning out your parties yet? I mean, how can you pass that printable up?! Be sure to stop by Club Narwhal to check out Amy’s yummy recipes and fun printables (I would recommend this awesome Mindy Kaling quote that I framed up last week)! Yeay, thanks so much for including me in your awesome series! 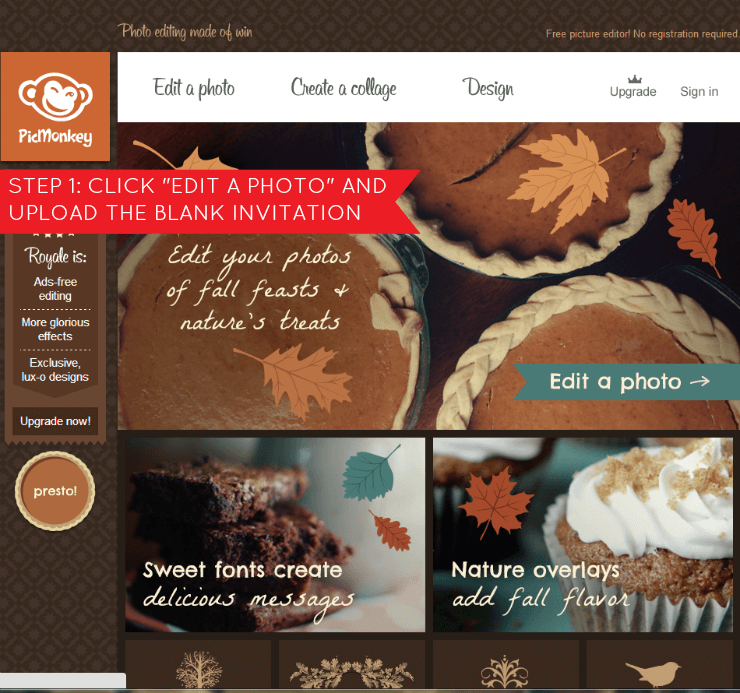 Had no idea PicMonkey was this easy to use. Very useful tutorial, Amy! <br />I love the colors you used for the printable. It&#39;s the main color scheme in my living room :).